Like most of you, we try to find the value in everything that we possibly can – even others’ “trash”. We pride ourselves in being fair and yet competitive with the bigger guys. We have been in business for over 15 years in a small community – so we must being doing something that others like. We try to keep clean, efficient locations and we value quality customer service to the utmost. We service both commercial and household customers. Some customers will have very little in terms of metals and some will have truckloads. Please have your metals sorted as well as you can – this speeds up the time you will have to spend at our facility. Once you learn the differences in the types of metals you most often have, this becomes a simple task that makes everyone happier at the buy-back station. Once at our location, pull into (at Jefferson City) or back up to (at Columbia) the building and our staff will greet you with assistance in unloading your product. The staff will weigh each type of metal separately and record it on the buy-back ticket. The ticket will then go to the cashier where you will get the proceeds from your recyclables in either cash or check form depending on the amount. NOTE: Due to state law, any metal buy-back over $50 must be accompanied with a photo ID. If you have any questions about our service, please ask. We are more than willing to walk new customers through the process and welcome feedback. We have provided both a listing of all the materials that we accept and a current price sheet for the most common metals on the website. Almost anything that comes out of your house is recyclable – it just depends on you to decide what to collect and bring in to our site. Think about if you recycled all of your cardboard, plastic bottles, aluminum cans, newspapers, magazines, white paper (mail), tin cans, clothing, electronics and scrap metals around your house – what would be left for your trash can. The answer: not much. We know that realistically, not everyone is going to keep a garage full of recycling bins, but we ask that you take just a minute and browse our “What do we take” list and start small. Maybe pick one or two things that you think you can handle and then build up from there. Keep in mind, we do not accept glass, TVs or any plastics except for bottles and jugs (#1 or #2). Are you a small business owner or work in a corporation – we can help you reduce your waste and you can help us build our inventory. Sounds like a win-win for everyone. Check with our office and we would be more than willing to examine your business and see where we could assist in reducing the amount that is going straight from your work site to the landfills. Examples from labor intensive jobs include scrap metals such as copper, aluminum, brass, stainless steel, etc. From retail or factory, we accept cardboard, scrap metals, paper products, etc. From offices, we can start a recycling program right in your office including office paper (shredded or not), aluminum cans, electronics, computer parts, etc. Give us a call and see how we might be able to help. If you have large quantities of copper, aluminum, stainless, or brass give Corey or Mark a call for bonus pricing. There is no better way to save public money than recycling. You not only reduce the amount of waste within your organization but it is good PR as well. We currently service such entities as schools (public and private), cities, counties, colleges, correctional facilities and charities, just to name a few. We can visit your organization and see where you might be able to trim down but also keep things simple and efficient. We have large 96 gallon roll containers that make collecting easy and clean. We can schedule regular pick-ups or on an as needed basis. Our employees are always quick and polite. You will barely even know that they are there. With identity theft and fraud becoming more and more of a problem, document destruction has been on the rise. 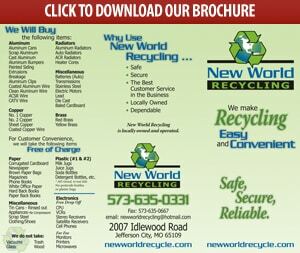 New World acquired an existing paper shredding business in 2006 and the volume of customers just keeps growing and growing. We offer an easy and convenient way to ensure that your personal or business documents are shredded to FBI standards and properly recycled from there. In 2009, we purchased a mobile shredding truck. We can come to you or your office during regular business hours. We offer regular pick-up services with locked carts or bins located in your offices at all times. We also offer the once a year, once a quarter, clean out that businesses with seasonal paperwork might need. Call our office for more detailed information about how we might be able to service your document destruction needs.